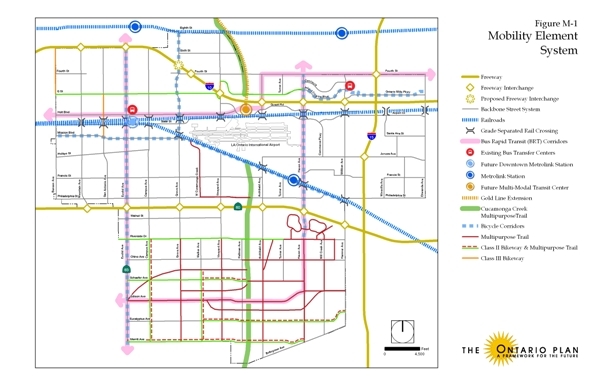 Our Mobility Plan provides multiple options including: roadways (for passenger cars, trucks, buses, and bicycles), rail lines (for freight rail and passenger rail), multi-purpose trails and sidewalks (for walking and bicycle trips), and LAONT Airport for air travel. Together, these options provide us with the mobility needed to enhance quality of life and economic growth. Our Mobility Plan and Functional Roadway Classification Plan have been developed to meet our future needs based on the estimated buildout of the Land Use Plan. As assumptions change, adjustments will be made to these Plans.